A backyard composting bin doesn’t need to be complicated. Food scraps and leaves will break down into compost even if they’re left in an open pile. However, most people create a container to maintain a cleaner yard, and to prevent attracting animals. 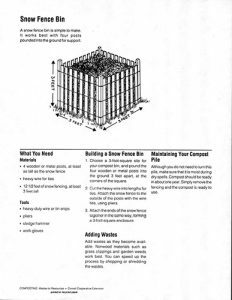 Download our backyard composting bin plans for a guide to building a variety of backyard composting bins; everything from a simple three-pallet option to the “taj mahal” of composting containers. The SoilSaver makes it easy to turn yard waste and food scraps into compost – black gold for your garden. Just layer your “browns” (leaves, paper, sawdust) with your “greens” (food scraps, fresh grass clippings), mix occasionally, wave your magic wand (not really), and behold – rich, dark compost! The SoilSaver is available for purchase at cost at Green Mountain Compost. Keep food scraps out of the landfill, reduce your trash disposal expenses, and make your own compost! Tough and weather-resistant, the SoilSaver 86 Gallon Recycled Plastic Compost Bin is made of 0.25-inch-thick structural foam, black recycled plastic. The material and bin structure are designed to hold heat inside for successful composting. The sturdy, insulated side panels bolt together, so you won’t have to worry about breaking snaps or clogged plastic tabs. Rust-free, nylon-threaded fasteners hold up well in the outdoor elements. The two top latches hold the lid securely in place. The 2-foot-square top opening makes it easier to fill and mix the contents, and two bottom doors provide full access for harvesting finished compost. View the SoilSaver on the Green Mountain Compost website. 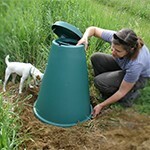 The Green Cone is a backyard digester that takes all household food waste, including vegetable scraps, raw and cooked meat or fish, bones, dairy products and other organic kitchen waste (e.g. tea bags, bread etc.). The Green Cone comes with a 5 liter kitchen caddy for collecting and carrying household food waste to the Green Cone. The Green Cone is available for purchase at cost at Green Mountain Compost. Keep food scraps out of the landfill, and reduce your trash disposal expenses! A well operating Green Cone produces very little waste residue. Should the residue build up to ground level and not decrease, the upper cone can be removed to access the basket. The residue can be dug into any suitable area of ground. View the Green Cone on the Green Mountain Compost website.